PROJECTS: BENEFITS OF BUYING "OFF THE PEG"
The flexibility of our "off-the-peg" designs was highlighted this week following a query from a client keen to sell on the vision of a well-designed, sustainable home. Recognising his existing property, a timber bungalow, is not very valuable compared to the plot it sits on, he has opted to use one of our designs to apply for detailed planning permission in the hope this increases the value and appeal of his site. This is just one of the ways in which Thomas Robinson Architects' "off-the-peg" range of designs and services can be adapted to suit a particular requirement. 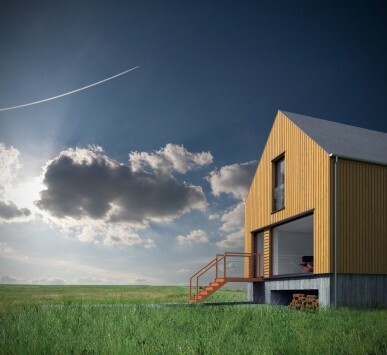 There are six different designs ranging from the compact Wood House that would suit first-time self-builders, downsizers, holiday letting or even small businesses, to a four-bedroomed Barn House, up to the Large Classic Bay with spacious public rooms and a large master suite with balcony. All these properties are extremely economical to run and align with Scottish Planning Policy - a benefit when applying for planning permission. You can buy a range of services from a digital copy of the plans and elevations to a full architectural service covering design, detail and delivery stages.